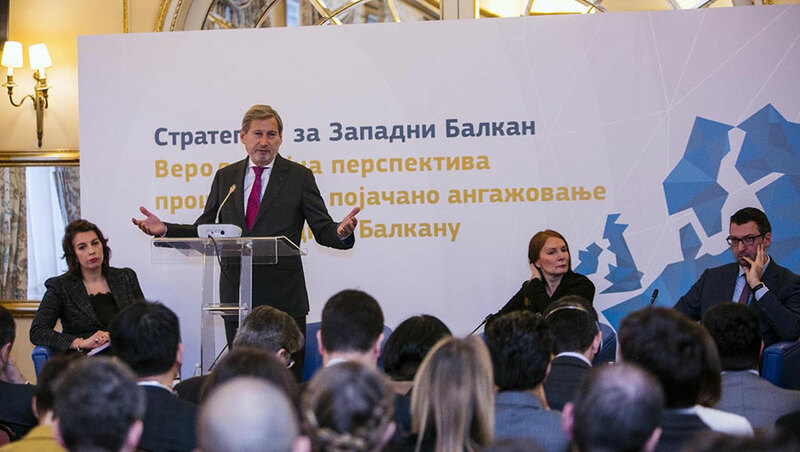 European Commissioner for Enlargement Johannes Hahn said that new Enlargement Strategy for the Western Balkans is not “a blank cheque” and that in order to become a member the country has to meet all criteria, especially the ones regarding the rule of law and normalization of relations with Pristina. At the conference “Strategy for the Western Balkans – Clearing the path for accession” Hahn said that 2025 perspective is only indicative. It is not set in stone, he said, adding that the country “will potentially be ready to join the EU by 2025” if it meets all conditions. “It is not a blank cheque and Serbia cannot simply wait for the time to arrive, it has therefore a lot of reforms to enact and implement until then,” Hahn said adding that “credible enlargement perspective also requires credible efforts and reforms”. The Strategy, he said, clearly states what needs to be done. “The Strategy is neither an invitation, nor a possibility of having a discount, it provides us only with guidelines for EU integration,” Hahn said. “Rule of law reform is about deep, far-reaching, transformational changes, strengthening the independence, impartiality and efficiency of the judiciary, stepping up the fight against corruption and organised crime, creating an environment that fully guarantees freedom of expression and of the media. These are some of key challenges that have a direct and tangible impact on citizens’ lives,” he noted. European Commissioner said the EU would simply refuse to import unresolved status issues, which is why Serbia has to resolve its bilateral and border issues. “The strategy spells it out clearly – Serbia needs to conclude and irreversibly implement a legally-binding agreement with Pristina before it can join the EU,” said Hahn. The Commissioner said that “in order for two partners to reach the solution, the coming period should provide enough space for the dialogue.” “There are numerous possibilities for a legally binding agreement, but it is much too early to talk about the final solution,” Hahn said. According to him, Kosovo has been given EU perspective and it should regard the Strategy as a motivation to find a solution with Serbia, one that would lead to normalization of relations. “So far, Kosovo has maintained a narrative which suggested that the dialogue served the interests of Serbia and Serbia only. The Strategy clearly spells out that reaching a positive solution is in Kosovo’s interest as well, as it will pave the way for Kosovo’s European integration,” European Commissioner said. “The EU should support the Western Balkan countries in moving forward, therefore we should not be speaking about specific dates, but rather about producing results and carrying tasks out,” Hahn said. The EU will enhance its engagement in the region, he said and added that the EU was a peace, stability and prosperity project EU and that it would be complete only with the Western Balkans as part of it. “I firmly believe that the process of European unification, which began in 1989, will only be complete with the accession of the Western Balkans to the European Union. It’s the path we share, but it’s up to you to produce results,” Hahn said. To a question regarding the freedom of media in Serbia, Hahn said that the EU “is working on it” and that he believes the rule of law would solve the problems of freedom of expression and media. “Just as any other country, Serbia experiences certain shortcomings that need to be eliminated. Politics is not the only decisive factor; economics should be brought into the formula as well,” Hahn said. He added that good economy is needed to secure competition and allow the press to work for independent media.